As Climate Week kicks off in New York City, David Miliband and Courtenay Cabot Venton shine a light on one group of people who are being hit hard by climate change – children. “Climate change risks destabilizing human society” said the UN as they issued their grim report on climate change earlier this year. US Secretary of State John Kerry commented: "Unless we act dramatically and quickly, science tells us our climate and our way of life are literally in jeopardy. Denial of the science is malpractice." This week, the UN Secretary-General, Ban Ki-moon, will meet with world leaders in New York for the UN Climate Summit. The Summit is designed to garner momentum and political will for concerted action on climate change ahead of a new international deal to replace the Kyoto Protocol that will be negotiated in Paris next year. It is scheduled to coincide with the UN General Assembly, one of the principal meetings of the UN. This timing is deliberate – climate and political crisis go hand in hand. Climate change exacerbates humanitarian crises, and places ever-increasing tension on political systems. The need for united political action is critical. But amidst the whirl of policymaking and political positioning, we must not forget the human face of climate change. Children are on the frontline of its impacts. A new publication released by UNICEF brings together articles from 40 experts to detail the accelerating threats children face. 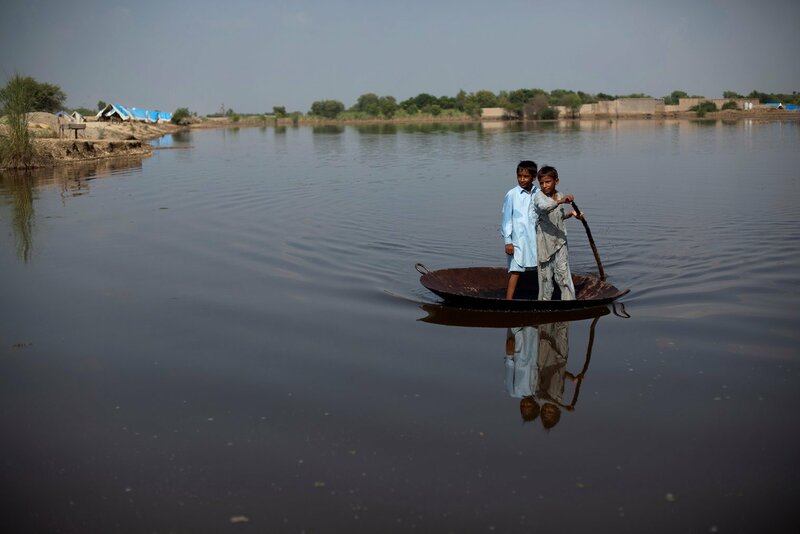 "As the effects of climate change become more visible and extreme, they are likely to affect adversely the lives of children and adolescents all over the world," said Anthony Lake, Executive Director of UNICEF in the report’s Foreword. "Over 99% of deaths already attributable to climate-related changes occur in developing countries – and children make up over 80% of those deaths." This is an argument for urgent adaptation to climate change, to moderate its worst current effects on people, as well as the vital matter of mitigating climate change through carbon reduction strategies. Meanwhile, in the humanitarian space, the problems are growing larger in number and more complex in scope. The number of people affected by humanitarian crisis has almost doubled over the last 10 years, and the cost has trebled. With more refugees and Internally Displaced People than ever before – 51 million last year, one every four seconds – the humanitarian system is stretched as never before. Fifty percent of these refugees are children and adolescents, uprooted from their homes as a result of crisis. They face heightened protection risks as they are abducted, used as soldiers, suffer sexual abuse and risk life-threatening illness. When the two trends come together – for which there is evidence for example in the Sahel region of Africa – the impacts are huge. The International Rescue Committee (IRC) has just published a report on women and girls in the Syria crisis, and their experience as refugees in the neighboring countries. The rhetoric and policy measures needed to afford women and children greater protection from sexual exploitation, domestic abuse and forced early marriage are much clearer than ten years ago. But in terms of practical action there is a long way to go – even on the most basic measures to increase security. It is easy to feel impotent in the face of the scale and complexity of crises such as Syria. But the report makes clear there are practical things to be done, from proper evaluation of need as measured against international commitments to a recognition that adolescent girls desperately need education to give them a chance of charting their own futures. Climate change and humanitarian crisis are the kind of problems that can shrink public appetite for action by virtue of their sheer scale. That is why governmental leadership is so important. The commitment of the UNSG Ban Ki-Moon to summon global leaders and confront them with the question of what they are going to do about climate change next week has brought proper engagement of a serious kind. It is an example of the kind of leadership that is needed. Twenty-five years ago, the world made a promise to children through the UN, to do everything in our power to protect and promote their rights to survive and thrive, to learn and grow, to make their voices heard and to reach their full potential. As we head into 2015 and a new deal for climate change, we have a mandate to live up to this promise, to take responsibility for our generation and ensure that future generations can thrive. Courtenay Cabot Venton and David Milliband. – This piece was co-authored by David Miliband and Courtenay Cabot Venton. This is a guest blog and may not represent the views of Virgin.com. Please see virgin.com/terms for more details. Courtenay Cabot Venton is an international development economist, and contributing author to the UNICEF publication Children on the Frontline. She works with international relief and development agencies to ensure that children are at the forefront of our work to reduce the impacts of climate change. David Miliband is the President and CEO of IRC. From 2007 to 2010, he served as the youngest UK Foreign Secretary in three decades, driving advancements in human rights and representing the UK throughout the world. As Secretary of State for the Environment he pioneered the world’s first legally binding emissions reduction requirements. His accomplishments have earned him a reputation as an effective and passionate advocate for the world's uprooted and poor people.